WASHINGTON — Former secretary of State Madeleine Albright decried the open letter to Iranian leaders signed by 47 Republican senators as "unprecedented and fairly outrageous," weakening the U.S. negotiating position and imperiling ongoing nuclear talks. "It's as if somebody had written, a group of members of Congress had written a letter to [Soviet leader Nikita] Khrushchev during the Cuban missile crisis and prevented some agreement to be made," she told Capital Download on Wednesday. "I'm surprised it's even legal, frankly." The letter, drafted by freshman Arkansas senator Tom Cotton and addressed to "leaders of the Islamic Republic of Iran," declared that any agreement reached without congressional approval could be undone by the next president "with the stroke of a pen." Multinational negotiators in Geneva reportedly are close to reaching a framework agreement aimed at curbing Iran's nuclear ambitions. Albright also defended Hillary Rodham Clinton, now under fire for her exclusive use of a private e-mail when she headed the State Department. "I thought she really did explain it, and she did say that she was sorry that she hadn't actually done two instruments," Albright said — that is, that Clinton hadn't used a BlackBerry with an official government e-mail address and a separate smartphone for personal messages. Albright, who describes Clinton as a friend, says the issue essentially is settled: "She said it [her official e-mails] would be available to the American public and she's open to questions about it." When Albright was secretary of State, she didn't use e-mail — but not because of concern about security or privacy. "I hate to admit this, but I had no idea how to use it, and it was not available," she told USA TODAY's weekly video newsmaker series. Albright led the State Department during Bill Clinton's second term, from 1997 to 2001. Now 77, she joked: " I always say that I went to college at a time between the invention of the iPad and the discovery of fire." Her most scathing remarks were directed at the letter signed by all but seven of the Senate's Republicans and apparently designed to undermine Iranian nuclear talks. President Obama, congressional Democrats and others have blasted the letter, which was released Monday. Albright — who has worked as a Senate staffer, a White House official and a Cabinet officer — called it at odds with the constitutional separation of powers. "Perhaps this is a sign of a brand-new senator who somehow hasn't even made his maiden speech and feels he has to make his name," she said. While Cotton, a former House member, was sworn in to the Senate just two months ago, the letter he drafted was signed by Senate Majority Leader Mitch McConnell, R-Ky., and other senior senators. Iranian leaders, reading the letter, "probably think we've lost it," she speculated. "It weakens us and I think it really makes them wonder where the power is." She was interviewed in the new downtown offices of the Albright Stonebridge Group, a global strategy firm she chairs. Leaning against the wall, still waiting to be hanged, were the White House commission naming her secretary of State, the presidential Medal of Freedom presented by Obama in 2012 — and the framed, original passenger manifest of the SS America from the voyage that brought her family to the United States in 1948. Her father was a Czech diplomat who eventually sought political asylum. Albright, the first female secretary of State, sat in the brown leather chair she had used in the Cabinet room. She discussed terrorism around the world — "The trend lines are very dangerous" — and the alarming success the jihadist group that calls itself Islamic State has had in recruiting young Muslims from the West. She also recalled her work to empower women and girls, including at the landmark Beijing conference convened almost precisely 20 years ago. 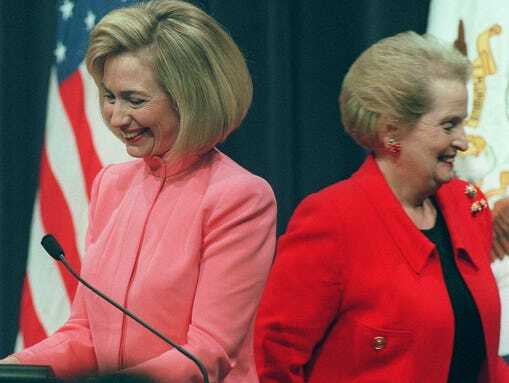 In 1984, she helped provide foreign policy advice to Geraldine Ferraro when Democratic presidential nominee Walter Mondale chose the New York congresswoman as his running mate, making her the first woman on a major party's national ticket. "Believe it or not," the questions being debated included "did you wear a suit or wear a skirt," she recalled. "People were amazed she could speak in sentences." That has changed in some but not all ways, she said. "Most of it is different now because there have been enough women in public life to create an image of what it should be like."